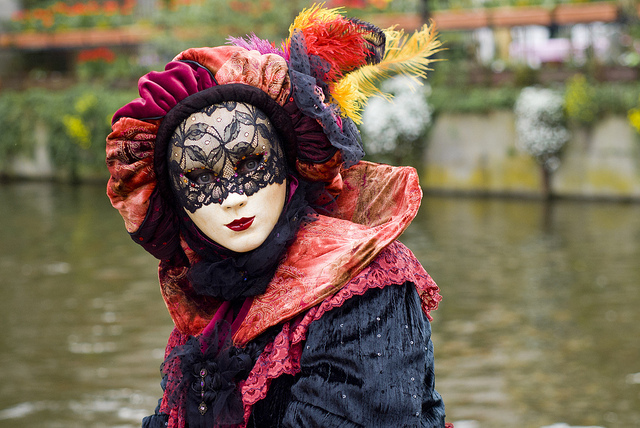 The Italian tax-benefit system, as many others, generates a number of marginal rates—the statutory tax rates and the implicit tax rates, determined by tax deductions and benefits. Effective marginal tax rates (EMTRs) result from the combination of statutory and implicit rates, and indicate the change in disposable income resulting from a change in gross income. Despite its economic and social relevance, there has been no systematic analysis of effective marginal tax rates in the Italian tax-benefit system, which can be compared to evidence for other countries and regions, such as Australia (Ingles & Plunkett 2016), the European Union (Immervoll 2004), New Zealand (McAlister et al., 2012), and the United States (CBO 2012; CBO 2015). To fill this information gap, we study the variability of effective marginal tax rates—overall as well as for each tax and benefit category—and effective average tax rates across the income distribution for the 2017 Italian tax-benefit system. 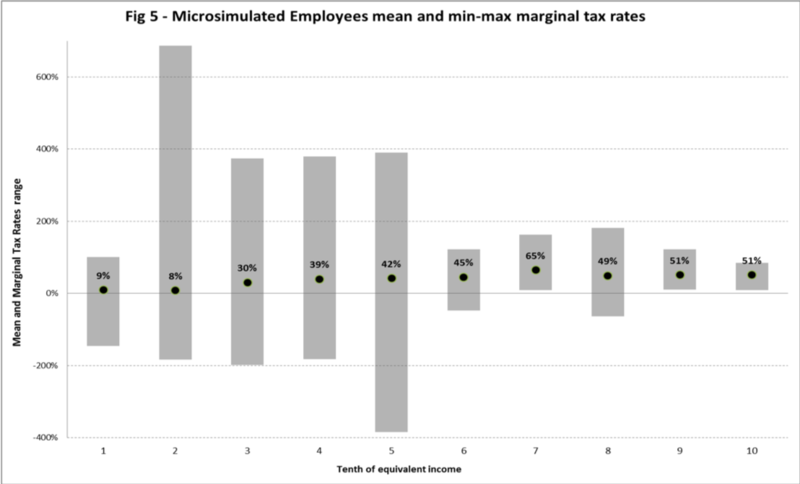 This article focuses on dependent workers, and we refer to our research (Di Nicola et al., 2017) for a complete illustration of effective marginal and average tax rates for all main taxpayer types. We first briefly describe the main elements of the Italian tax-benefit system for 2017. The standard compulsory social contributions rate is 9.2 percent of gross salary, which increases to 10.2 percent for salaries beyond 46,000 euro per annum. The social security contribution cancels out for gross salaries beyond 100,000 euro. Tax deductions associated with different types of income: employee, retiree, self-employed. For employees, tax deductions amount to 1,880 euro for incomes below 8,000 euro (therefore, no tax is due for incomes below 8,150 euro, unless other deductions apply), and decreases beyond that threshold. The decrease is rapid up to 28,000 euro and more slowly beyond that point, until it vanishes at 55,000 euro (thus producing an implicit rate of 3.6 percent). There are no tax deductions for incomes above 55,000 euro. This dynamic has the undesired effect that the effective marginal tax rate for incomes between 38,000 and 55,000 euro is slightly larger than the 41 percent statutory rate applied to higher incomes—these are, however, subject to a larger average rate, thus preserving progressivity and the distributional role of the personal income tax. Family-related deductions are enjoyed by personal income tax payers with children or other dependent family members. This type of tax deduction depends on family member type (spouse, child, or other), child age (above or below 3), child disability, the number of children (more or less than 3), and the income level. Family-related tax deductions may generate additional tax rates between 1 and 3.5 percentage points. Family allowance is applied to households whose earnings from employed work amounts to at least 70 percent of overall income. The employer’s contribution to the allowance amounts to 0.68 percent. This non-taxable allowance is determined according to parameters depending on the type and number of family members and income level. The overall household income is computed including non-personal income taxable items, such as financial earnings. Income brackets are annually revised by the National Institute of Social Security (Italian: INPS), based on changes in the cost of living. The family allowance decreases as income increases, and similar to the family-related deductions, the rate depends on the family structure. This thus produces supplemental tax rates that are extremely erratic, from 0.5 to 15 percentage points and more. The local personal income surtax is levied by regional and municipal authorities. Within certain limits on income brackets and rates set by the National Government, around 8,000 municipalities and 20 regional authorities have widely differing personal income surtax rates. In particular, low-income earners face a high effective marginal tax rate as a consequence of the additional tax rate vanishing if net personal income tax becomes null. By crossing the personal income tax exemption threshold, taxpayers must pay an additional local tax levied on their overall income, and not only on the exceeding income. The effective marginal tax rate is thus larger than 100 percent. Next to the income ranges that exhibit very high rates, the marginal local tax rate oscillates between 1 and 3.5 percentage points. The bonus was introduced by the Italian Government in 2014. It consists of a monthly fixed amount allowance of 80 euro, paid to employee and related workers whose overall income is between the personal income tax exemption threshold (net of employment tax deduction, corresponding to 8,150 euro) and a maximum income of 24,000 euro per year. Beyond this level, the allowance decreases rapidly and linearly until it cancels out at an income of 26,000 euro (in 2018, these two thresholds have changed to 24,600 euro and 26,600 euro). As income oversteps the exemption threshold, and the employee receives the bonus—amounting to 960 euro per annum—the effective marginal tax rate is negative (that is, a marginal benefit) and larger than 100 percent. Conversely, between 24,000 euro and 26,000 euro (24,600 euro and 26,600 euro in 2018), the bonus decreases gradually and rapidly, so the specific implicit rate becomes 48 percent. As we see in Figure 1, in this income range, the sum of statutory and implicit tax rates produces an effective marginal tax rate of around 100 percent. 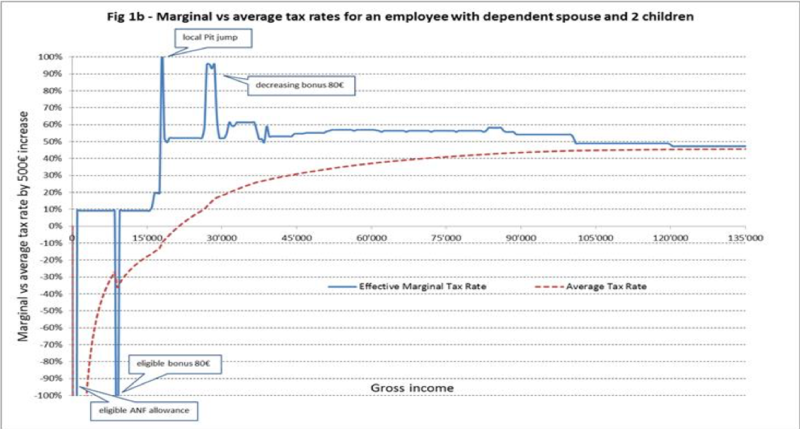 Figure 1 shows, for one of the most prevalent taxpayer types—employee with dependent spouse and two children—and for each income level, the marginal tax rate generated by each component listed above, along with the global effective marginal tax rate (with a thicker line) resulting from their interaction. 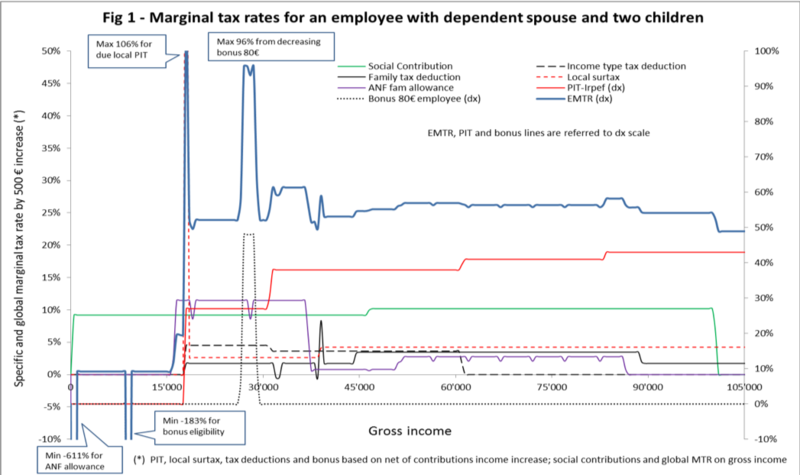 To improve readability, social contributions, income type-related deductions, family-related deductions, local surtax, and family allowances rates are reported on the left-hand side axis, while the statutory personal income tax, “80 euro monthly bonus”, and effective marginal tax rates are reported on the right-hand side axis. 5. The “80 euro monthly bonus” causes two spikes, one negative and one positive: the first above the personal income tax exemption threshold and the second when the bonus decreases within the 24,000-26,000 euro taxable income range. 4. The slight decrease for gross income levels above 100,000 euro. The comparison of effective marginal and average rates illustrated by Figure 1b confirms that the Italian tax-benefit system does not appear to be designed with a consistent framework. Notice that, as the income level crosses the “80 euro monthly bonus” threshold, the taxpayer gains right to a 960 euro allowance, resulting in a strongly negative effective marginal tax rate and a reduction of the average rate. This appears to be an undesirable effect of the system, because it implies a regressive redistribution in a certain income range. We present now, based on the results of the tax-benefit microsimulation model of the Department of Finance of the Italian Ministry of Economy and Finance (Di Nicola et al., 2015), the distribution of effective marginal tax rates for a representative sample of taxpayers, reporting both the maximum-minimum intervals as well as the mean of the distribution for each income range. This exercise proves to be useful in understanding the interaction of taxes and benefits, taking into account the actual probability that benefits apply to different income level taxpayers. By analysing a real-world sample of taxpayers, other factors determining effective marginal tax rates are brought to the forefront. Consider, for example, the common condition of mixed family earnings—from employment and self-employed work. If the latter is more than 30 percent of the total income, the household will lose their entire family allowance. As a result, the observed effective marginal tax rate takes a jump. To account for this further source of variation in rates, we compute for each income decile the range of rate dispersion (maximum and minimum) around its mean level. Results are reported in Figure 2 (Figure 5 of our paper). Our main findings highlight the large variability of effective marginal tax rates at low income levels. 3. Family tax deductions suffer from both not reaching the poorest households and from being computed on an individual basis. It would be useful to extend the mechanism of family allowance, which computes amounts explicitly on the basis of an “equivalent” income. 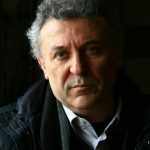 Fernando Di Nicola was a fiscal policy advisor for the Italian Finance Ministry until 2017, and is now an advisor and a microsimulator for social policies and pensions at the Italian National Institute for Pensions and Social Policies (INPS). 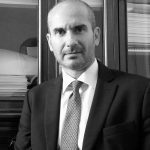 Giorgio Mongelli is a fiscal policy advisor and a researcher, responsible for tax-benefit microsimulation modelling, at the Italian Finance Ministry since 2011.